“Often my work stems from a question in my mind or an interesting data set,” says Thorp. Our case study was based on a very profound data visualization artist, Jer Thorp, whose work focuses on adding narrative meaning to huge amounts of data. 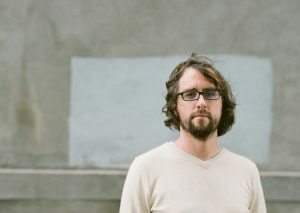 An artist and educator from Vancouver, Canada, Jer Thorp currently lives in New York and has a background in genetics. His digital art practice explores the many-folded boundaries between science, data, art, and culture. Thorp’s award-winning software-based work has been exhibited globally. Not only is Jer Thorp the co-founder of ‘The Office for Creative Research’, a hybrid research group, working at the intersection of technology, culture and education, but is also a Professor at New York University’s ITP Program, has collaborated recently with NASA visualized in ‘138 years of Popular Science’, has exhibited work at MoMA (Museum of Modern Art) in Manhattan, has been a speaker at multiple TED Talks and is a member of the World Economic Forum’s ‘Council on Design Innovation’. Our presentation of Jer Thorp’s work included an overview of his select pieces and an in-depth study of two specific projects that Ginger and I found captivating for many reasons. Project Cascade (2010 – 2011) – visualizes the sharing activity of New York Times content over social networks. Sustained Silent Reading (2010) – the system uses semantic analysis to ‘read’ through a base of content. Random Number Multiples (2011) – produces screenprints from the work of computational artists and designers. 2. The metamorphosis of data into visually stunning pieces of art, that can in fact be purchased and become art collections! According to Thorp, “A rare datum might find itself turned into sound, or, more seldom, manifested as a physical object. Always, though, the measure of the life of data is in its utility. Data that are collected but not used are condemned to a quiet life in a database”. Jer Thorp and his colleagues have been investigating the possibility of using data as a medium for performance. Here, data becomes the script, or the score, and in turn technologies that we typically think of as tools become instruments, and in some cases performers. In this performance — A Thousand Exhausted Things, the script is MoMA’s collections database, an eighty year-old, 120k object strong archive. 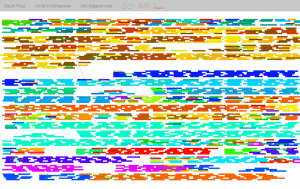 The instruments are a variety of custom-written natural language processing algorithms, which are used to turn the text of the database (largely the titles of artworks) into a performable form. During this entire period, all of the dialogue that is spoken by the actors is either a complete title of an artwork, or a name of an artist. A data visualization, projected above the performers, shows the objects as abstracted forms as each artwork is mentioned. By using such a non-conventional form to engage with the collections database, they tried to ask the audience to think of the database as not just a myriad of rows and columns, but as a cultural artifact. Performance provides rich terrain for engagement with data, and perhaps allows for a new paradigm in which data are not as much operated on as they are allowed to operate on us. In late October, 2009, Jer Thorp was contacted and commenced work on a project with an Experience Design Studio called Local Projects located in New York City. 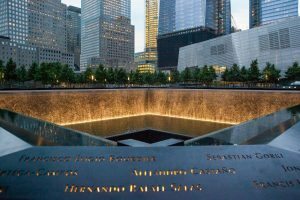 The aim was to design an algorithm for placement of names on the 9/11 Memorial. According to Jer Thorp, “In architect Michael Arad‘s vision for the memorial, the names were to be laid according to where people were and who they were with when they died – not alphabetical, nor placed in a grid. Inscribed in bronze parapets, almost three thousand names would stream seamlessly around the memorial pools. Underneath this river of names, though, an arrangement would provide a meaningful framework; one which allows the names of family and friends to exist together. Victims would be linked through what Arad terms ‘meaningful adjacencies’ – connections that would reflect friendships, family bonds, and acts of heroism. 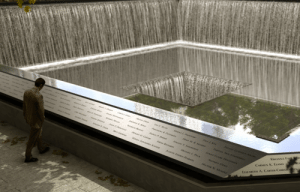 Through these connections, the memorial becomes a permanent embodiment of not only the many individual victims, but also of the relationships that were part of their lives before those tragic events”. Over many years, staff at the 9/11 Memorial Foundation undertook the meticulous process of collecting adjacency requests from the victims next of kin, creating a massive database of requested linkages leading to a total of more than one thousand adjacency requests. 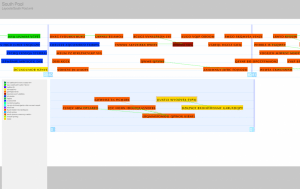 The next challenge was that of optimization as they had to find a layout that fulfilled these adjacency requests. However, Thorp found a solution to the problem and in order to produce a layout that would give the Memorial Designers a structure to base their final arrangement of the names, his team built a software tool in two parts: First, an arrangement algorithm that optimized this adjacency problem to find the best possible solution, and second, an interactive tool, built in Processing, that allowed for human adjustment of the computer-generated layout. The solution for producing a solved layout for the names arrangement was placed at the bottom of a precariously balanced stack of complex requirements. Some of the challenges included – a basic spatial problem where the names for each pool had to fit, evenly, into a set of 76 panels (18 panels per side plus one corner), another obvious challenge was to place the names within the panels while satisfying as many of the requested adjacencies as possible as there was a dense set of relations that needed to be considered. To add to these problems, within the crucial links between victim names, there were a set of larger groupings in which the names were required to be placed: affiliations (usually companies), and sub-affiliations (usually departments within companies). However, Jer Thorp, found solutions to these problems through the generation of an algorithm in which the complete process was a combination of several smaller routines: first, a clustering routine to make discrete sets of names in which the adjacency requests were satisfied. Second, a space filling process which placed the clusters into the panels and filled available space with names from the appropriate groupings. Finally, there was a placement routine which managed the cross-panel names, and adjusted spacing within and between panels. The end result from the algorithm was a layout which completed as many of the adjacency requests as completely as possible. With this system, they were able to produce layouts which satisfied more than 98% of the requested adjacencies. Early on in the project, it had become clear that the final layout for the names arrangement would not come directly from the algorithm. While the computerized system was able to solve the logistical problems underlying the arrangement, it was not as good at addressing the myriad of aesthetic concerns. The final layout had to be reviewed by hand – the architects needed to be able to meticulously adjust spacing and placement so that the final layout would be precisely as they wanted it. With this in mind, they built a custom software tool which allowed the memorial team to make custom changes to the layout, while still keeping track of all of the adjacencies. The tool, built in Processing, allowed users to view the layouts in different modes, easily move names within and between panels, get overall statistics about adjacency fulfillment, and export SVG versions of the entire system for micro-level adjustments in Adobe Illustrator. Other features were built in to make the process of finalizing the layout as easy as possible: users could search for individual names, as well as affiliations and sub-affiliations; a change-tracking system allowed users to see how a layout had changed over multiple saved versions, and a variety of interface options allowed for precise placement of names within panels. In conclusion, Thorp goes on to express his views on the profound emotional connect he had with this 9/11 Memorial project. The very reason in fact, why I chose to do an in-depth study and focus on this unique project, given the passionate New Yorker I am, and the intensity at which it resonates, since I lived through the tragic event. He articulates the importance of the weight of data and his awareness of the names that he was working with, were those of near and dear one’s who were tragically lost in the 9/11 event. He expresses, “In the days and months that I worked on the arrangement algorithm and the placement tool, I found myself frequently speaking these names out loud. Though I didn’t personally know anyone who was killed that day, I would come to feel a connection to each of them”. For Thorp, while names of the dead may be the heaviest data of all, almost every number or word he worked with, endured some link to a significant piece of the real world. He says, “It’s easy to download a data set – census information, earthquake records, homelessness figures – and forget that the numbers represent real lives”. The experience through this process helped add meaning to such a significant monument and will never be forgotten.